Bananas Foster is a spectacular dessert that only requires a few ingredients to make. It is hugely popular in New Orleans. This is not only because it is delicious, but it is also where it was invented. 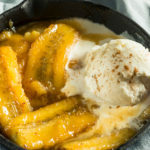 Bananas Foster Dessert served in an individual cast iron skillet. In the 1950’s New Orleans was the major port of entry for bananas that were being imported from Central and South America. A local restaurant owner challenged his chef to create a unique dessert using this widely available fruit. And the result, the birth of Bananas Foster. The owner loved the dessert so much that he named it after his good friend, Richard Foster, who was a local business leader. Bananas Foster starts with peeled bananas that have been sliced in half horizontally. 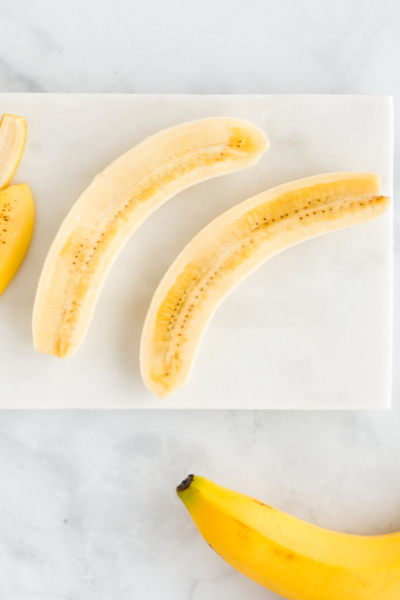 Slice the peeled bananas to make two long halves. Then cut each one in the center to make 4 pieces. They are then sauteed in a cinnamon-sugar, butter mixture and then drenched in banana liqueur and dark rum. Minutes later, they are set on fire so the liquor can quickly burn off. 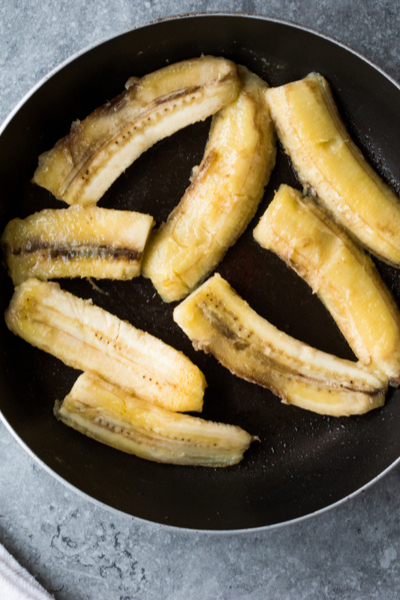 This leaves you with soft bananas in a smoky rum flavored sauce. 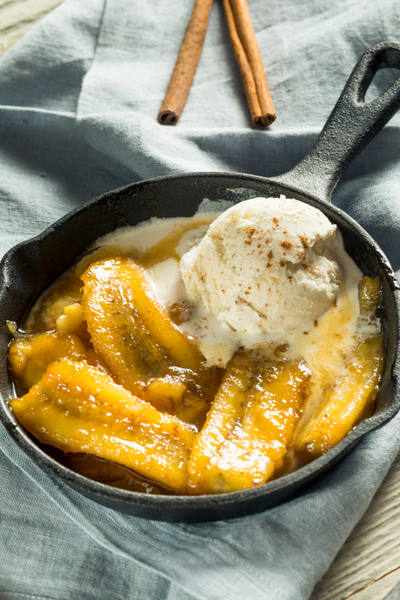 Served with a scoop of vanilla ice cream and you have a delicious, yet classic, Bananas Foster dessert. Traditionally, this dessert is prepared table side by a chef. A cooking cart is brought to the table so that the guests can witness the impressive burst of flame when the rum is lit on fire. The bananas are added in the skillet with the cinnamon-sugar and butter mixture. However, this process can be intimidating to the novice Bananas Foster chef. 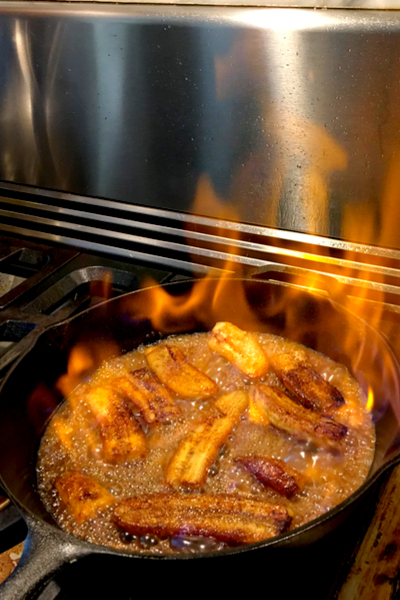 Because you don’t want the bananas to become too soft during the cooking process, it is crucial that the rum be flash burned to remove the alcohol from the dessert. But there are a few tips that you will want to follow for maximum safety when completing this at home. First and foremost, be sure to have a large lid that will fit over the skillet readily available during the cooking process. If you feel like the flame is out of control, simply place the lid on the skillet and the flame will be snuffed out. The alcohol in the rum is being burned off directly in the skillet. Secondly, wait until the rum is warmed up before lighting it on fire with a long lighter. This will allow time for alcohol to heat up and burn off quickly. And finally, be sure to tilt the skillet away from you and at an angle. This allows the alcohol to gather in one area rather than over the entire surface of the skillet. And if you are totally terrified to try to this technique there is another option. Place the rum in a separate sauce pan and bring to boil. Boiling for 30 seconds will allow the alcohol to evaporate. After that, it can be added to the bananas to provide the rum flavor to the dessert. A warm dessert consisting of bananas cooked in a brown sugar and cinnamon sauce and then flavored in banana liqueur and rum and served over a scoop of vanilla ice cream. Combine the butter, sugar and cinnamon in a deep sided flambé skillet. On low heat stir the mixture until the sugar dissolves. Stir in the banana liqueur and then place the bananas in the pan. When the liquid begins to bubble tip the pan slightly and ignite the rum with a long lighter. *Have a lid handy just in case you need to extinguish the flames. When the flames subside take the bananas out of the pan and place 4 slices of banana over a scoop of ice cream. Spoon the warm sauce over the top of the ice cream and serve immediately. Be sure to heat the rum prior to lighting it on fire as cold alcohol will not flame up. You can omit the flaming process if you prefer.